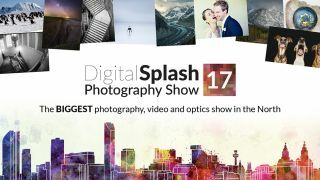 Major manufacturers and a host of top photographers are set to return to Liverpool in October for the Digital Splash photo show. The event, which is the largest photo and optics show in the north, will be held over 7-8 October at Liverpool's Exhibition Centre. Manufacturers including Canon, Nikon, Fujifilm, Sony, Olympus and Panasonic will be exhibiting their latest products at the show, with experts on hand to provide advice and answer questions. Joining them will be a range of accessory manufacturers, including Billingham, Cokin, Manfrotto and Think Tank Photo. A range of speakers has also been lined up for the event. These include Fujifilm X-series photographer Matt Hart, wedding photographer Jeff Ascough, David Lindo, a.k.a. The Urban Birder, and Nikon ambassador Kate Hopewell-Smith. Future's very own Digital Camera, N-Photo, PhotoPlus and Professional Photography magazines will also be at the show. Attendees will also be able to brush up their skills at a host of workshops and take advantage of show offers, and those who register in advance before 22nd September can get free admission to the event, together with 10% off any purchased talks. To find out more and to browse the full range of speakers and exhibitors, head over to the Digital Splash website.